Today I’m bending the rules, because it’s the birthday of one of my best friends, Lily. 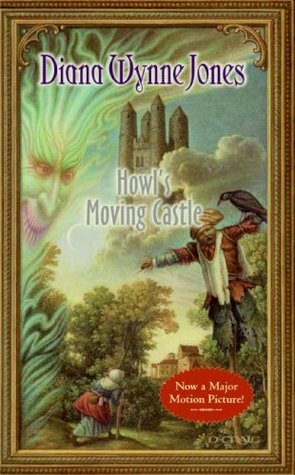 Years ago, I recommended Diana Wynne Jones’ fantasy novel Howl’s Moving Castle to her, and now it’s one of her favorite stories. Although she currently lives in Tokyo and spends her free time reading in Japanese, I thought I would celebrate the book we shared together. I wouldn’t say it qualifies as a “masterpiece,” but it’s certainly an outstanding read. Jones published her novel in 1986, and it tells the tale of Sophie Hatter, a young hat-maker who is cursed by the Witch of the Waste. After becoming displeased with Sophie’s hats, the witch turns her into an old woman. Determined to break the curse, Sophie becomes the maid for the wizard Howl, a 28-year-old, self-centered, narcissistic man rumored to eat pretty girls’ hearts. Howl lives in his moving castle with his 15-year-old apprentice Michael and the fire demon Calcifer, who powers the place. What makes Howl’s castle able to “move” is its magical entry, with a doorknob which has four dabs of paint to represent its different locations. Howl’s mysterious past and many psuedonyms allow him to travel through this fantastical world relatively unnoticed, that is until he must face his own cowardice and help Sophie destroy the Witch of the Waste. 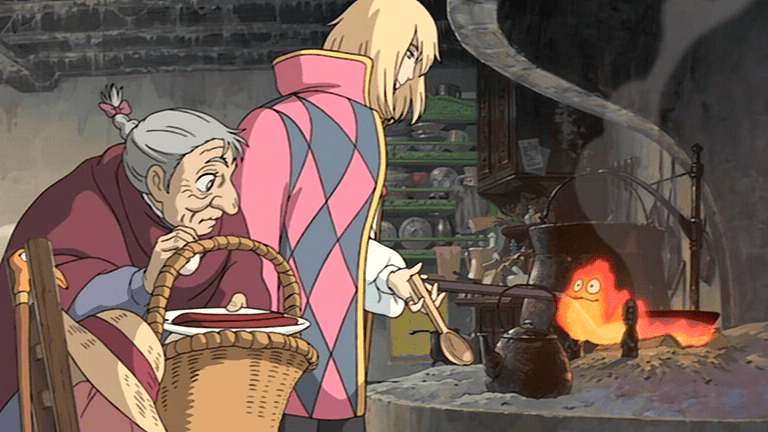 This is a unique love story as well, given that although Howl is aware of Sophie’s curse, she lives with him as an old woman. Howl even initially courts Sophie’s sister Lettie. Not to mention, it takes a while for Sophie to look past Howl’s vanity and messiness and find the good within. But while I won’t give away the whole plot, don’t worry, there’s a happily ever after! Once you’ve read Howl’s Moving Castle, you should watch Hayao Miyazaki’s 2004 anime feature film of the same name. 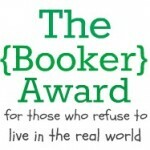 I’ve mentioned the movie before when I discussed my favorite literary vacation destinations, and it is really worth the watch. There are vast differences between the book and film, the biggest being Miyazaki’s inclusion of supernatural creatures. The film also added the element of war, with Howl refusing to fight for pacifist reasons. And although Sophie is cursed in the movie, the witch devolves into a humorous, harmless character rather than the powerful sorceress she is in the book. According to interviews, Miyazaki did not consult Jones, but allowed her a private viewing, after which she called the film “fantastic.” However, do not mistake Jones’ sequel to Howl’s Moving Castle, called Castle in the Air, for another Miyazaki movie called “Castle in the Sky.” The two are entirely unrelated. So if you’re interested in experiencing a fun, magical tale of love and friendship, I highly recommend Howl’s Moving Castle. It’s a story that brings close friends even closer–so happy birthday, Lily!!! The first is a stage adaptation of one of my favorite movies of all time, “Shakespeare in Love.” The New York Times reported that, “Two leading producers, Disney Theatrical Productions and the British impresario Sonia Friedman, have been holding meetings with the playwright Tom Stoppard – who shared an original screenplay Oscar for “Shakespeare in Love” with Marc Norman – and the director Jack O’Brien about the project, according to theater executives familiar with the creative discussions.” Nothing’s set in stone yet, but I’m glad that it’ll be a play, not a musical. I loved the film’s interpretation of Shakespeare’s personal life, so I’d definitely check out a stage version if I could! APOCALYPSE 2388. Earth is on the brink of extinction. Legendary explorer KURTZ has been sent on a desperate last bid mission to scout an unknown planet on the far side of the universe. A planet that may sustain human life. But communication with Kurtz mysteriously ceases and rookie flight officer MARLOW is assigned the perilous task of completing the objective. Tracking Kurtz into the unknown he reaches it. A new earth. And a race of beings at the dawn of time. But Kurtz has his own plans for the new world and man’s last hope for survival. And to achieve it he will take man to the only place that will protect paradise. Into darkness. I’m highly disappointed that this adaptation, as well as its more famous predecessor “Apocalypse Now,” takes Conrad’s work and creates a sci-fi version. When are people going to realize that nothing beats the original story-line! Lastly, my most anticipated movie adaptation is Studio Ghibli’s Japanese animated version of Mary Norton’s children’s book series The Borrowers, translated into English as “The Secret World of Arrietty.” This dubbed anime comes out in the U.S. February 17, and stars Will Arnett, Amy Poehler, and Carol Burnett as the English voice actors. I’ll definitely watch this in theaters, but when the DVD is released, I prefer to watch it in its original Japanese with English subtitles. I love Studio Ghibli so much! So that’s what’s new in book-to-movie news this week. I’ll keep you updated! And feel free to send me your own adaptation updates too!